Ein SWARMCUBE ist eine kinetische Lichtskulptur bestehend aus 64 Leuchtdioden. Ein dreidimensionaler Würfel aus Licht, der sich in ständiger Wandlung von Helligkeit, Zeit und Rhythmus befindet. Über einen Lautsprecher und einem Mikrophon, der “Kommunikationsebene” kann er Töne und einfache Melodien von sich geben und auch darauf reagieren. Ein einzelner Swarm Cube ist fremdgesteuert, d.h. wir “Erbauer” können mittels Computer oder Handy den Cube kontrollieren und ihm Verhaltensinstruktionen geben. In einem Kollektiv von SWARMCUBES jedoch entwickelt sich ein emergentes System, ein Prozess autonomer Kommunikation und Lichtbewegungen. Je größer die Anzahl der Swarm Cubes desto einzigartiger wird die kinetische Lichtskulptur, desto selbstorganisierter die Veränderung von Zuständen. SwarmCubes, ART ON WIRES FESTIVAL, OSLO 2011 from ndx39 on Vimeo. The cube consists of two circuit boards on top of each other, connected via a 16-pin connector. The lower circuit board contains the Arduino, the battery charger, microphone and DTMF-detector. It can work independently as a regular Arduino by placing a 100nF capacitor across the topmost pin and the fouth pin from the bottom of the inter-circuit-board connector. The LEDs of the cube are connected to the top board, which also contains the system processor (ATMega32) and the audio playback circuitry. When power is switched on, first the system processor on the top board takes control and keeps the Arduino in permanent reset. If a computer attached via USB starts talking to the board using the right protocol the computer can control the Cube by completely bypassing the Arduino chip. If no computer is detected – or a “wrong” byte is received the Arduino is woken up and control passed onto it. Communication between the Arduino chip on the lower board and the system chip on the upper board is perfomed using SPI (Serial peripheral interface). This just uses very few pins on the Arduino. An Arduino-library has been developed to simplify using this interface. 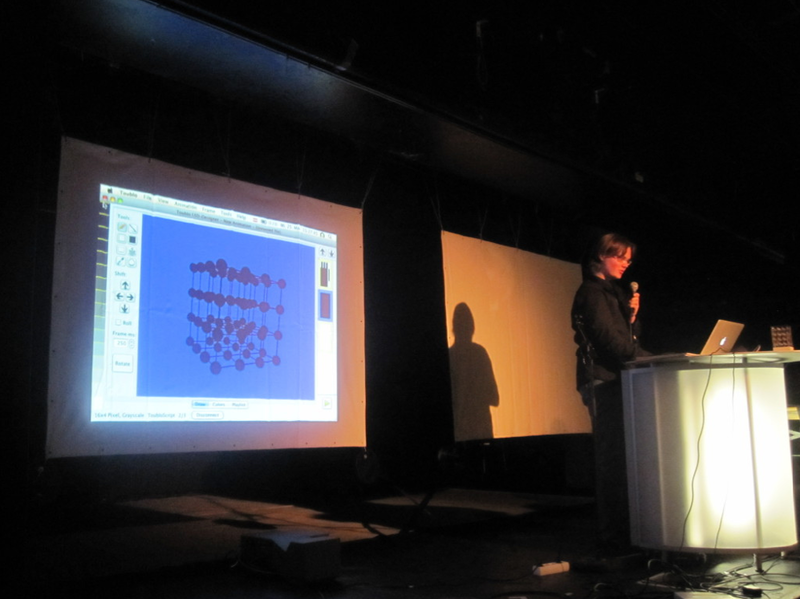 The SWARM CUBES communicate with each other using sound. If an Arduino wants to send a certain signal to the other cubes it can instruct the system processor to play any of the 16 DTMF-tones over the loudspeaker. If the DTMF-detector chip on another swarmcube “hears” this signal it changes it’s statuslines. The system processor of that other cube reads out the statusbyte and passes it on to it’s Arduino which handles the received information. Compared to other methods of communication soundwaves are one of the cheapest solutions. They also give you the interesting oppurtunity to observe the communication between the devices using no other equipment than your ears. Also you probably already have a transmitter to “talk” to the cubes in your pocket – your cellphone. Another use for your cellphone (or Skype) is to expand the communication distance of your cube by just “calling” another Swarmcube on the phone. It makes no difference whether the sondwaves just travel through the air or through a phone line. 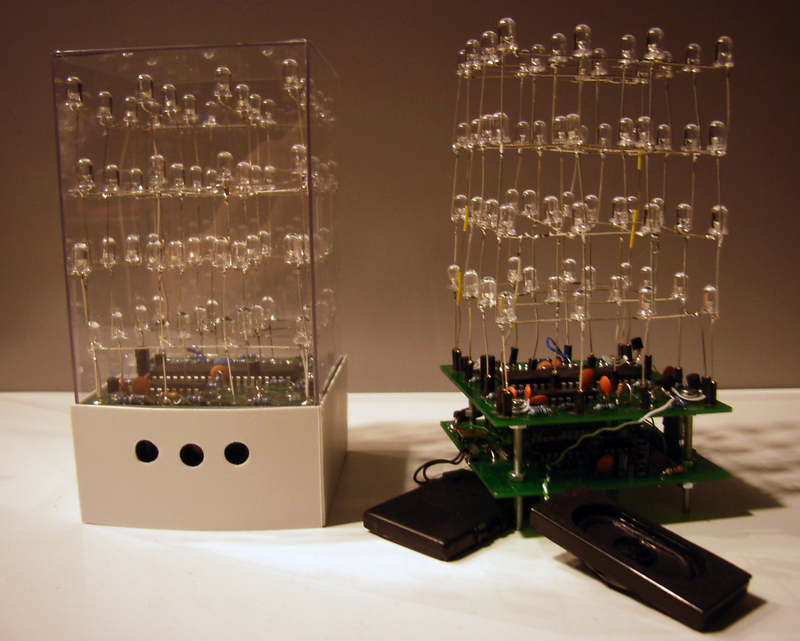 THE SWARM CUBE has 64 LEDs. 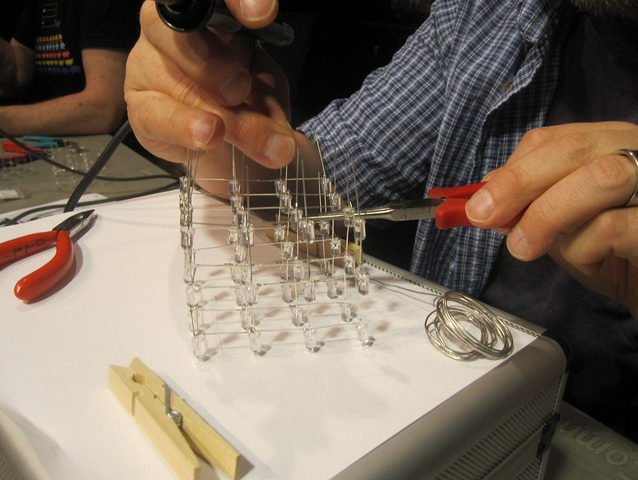 It’s a 4 x 4 x 4 LED Cube, having 4 LEDs each across length, width and height. There are 4 layers, each with 16 LEDs. 16 Vertical Lines feature 4 LEDs, one from each layer. Physical Dimension of Cube is 6 x 6 x 6 cm, consecutive LEDs are separated by 2cm. LEDs used are 5mm (T1-3/4), round of any color. Rectangular/Oval Shaped LEDs can be used but will cause problem when holding them during construction. Diffused LENs mean a wider viewing angle, better for side viewing. LED Leads should be 1” (2.5 cm) long, leads themselves are used to connect consecutive LEDs which are 2 cm apart. ELECTRICAL CONNECTION The 3D LED Cube is a 16 x 4 multiplexed display, with 16 common Anode connections and 4 common Cathode connections. Each layer has 16 LEDs, with one common Cathode. Total of 4 layers means 4 common Cathode connections. There are two modes of operation of the LED-Cube. Either the cube can be interfaced by a PC or it can work as an Arduino. In direct PC-mode the Arduino is completely disabled, therefore you are always able to access the cube via the PC, not depending on any specifiy sketch loaded onto the Arduino chip. To control the cube via your PC you can use the open source Toublo Animation Editor which you can download from http://www.dkia.at/downloads/ or build from source. LED Swarmcube Animation Software Tutorial (OS X) To work with the Arduino-Chip you can use the regular Arduino software which you can get from www.arduino.cc – you just have to pick the right serial port and select the Lilypad Arduino as the target. The Lilypad has to be selected because, like this cube, it runs on only 8MHz instead of 16MHz. We will collect Arduino sketches on our website www.dkia.at to share und exchange thoughts and ideas.